College of Idaho athletic director Reagan Rossi announced this morning that associate head coach Colby Blaine has been named the 16th men's basketball head coach in Coyote program history. Blaine replaces Scott Garson, who resigned after five seasons to accept an assistant coaching position at NCAA Division I Santa Clara University. 'I think the word excitement is an understatement,' the Boise native said upon taking the position. 'Pumped, stoked, eager, anxious - excited is definitely an understatement. Getting to work for Coach Garson has changed my life. What he has taught me over the last four years completely shaped my coaching style.' 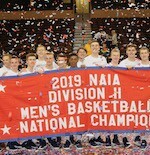 In Blaine's four seasons at C of I, including the last two as associate head coach, the Coyotes have advanced to three NAIA Division II national tournaments, reaching the national quarterfinals in 2015 and the national semifinals in 2018. The Yotes were a combined 101-36 with Blaine on the bench. 'We are excited to know that while transitions can be difficult, we have a tremendous leader in Colby Blaine ,' said Rossi. 'He has made an impression on this program from Day 1 and we are fortunate that we get the opportunity to watch him take the next step in his career as the head coach of the Coyotes.' Blaine, a 2009 graduate of Montana Western, began his coaching career at his alma mater under Steve Keller, before spending five seasons as an assistant at the College of Southern Idaho. At CSI, he helped the Golden Eagles win three Region 18 titles and the 2011 NJCAA national title, compiling a combined 137-33 record. 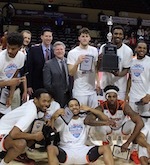 'I've now worked for four head coaches (Keller, Steve Gosar, Jeremy Cox, Garson) who have state championship experience, who have junior college national championship experience, who have NCAA championship experience and NAIA national tournament experience,' Blaine said. 'The four men I have worked for are incredible and they all taught me something different.' Coming off a 30-7 season and a Cascade Conference title, the Yotes return three starters and eight players for the upcoming 2018-19 season. 'This program is so healthy right now, as healthy as any program in the country,' Blaine said. 'I am excited to have returners coming back. It is going to help the transition in understanding not only what we are doing on the court, but the responsibilities off the court, along with the responsibilities of this program in the community and on the national stage. We just came off a fantastic season, with a style that we built together. I don't expect a ton to change in terms of who we are or how we present ourselves on and off the court. I certainly will add some twists and quirks on how we do things. I bring a different style as to who I am, but I don't expect much to change in terms of our depth and how we win games.' The Boise High graduate has coached with Select AAU Program for the past nine years, working with some of Idaho and Montana's top high school prospects. 'I've had a chance through AAU basketball to run a team, building that chemistry that is truly needed,' Blaine stated. 'Two years ago, I had the opportunity to take the Yotes for a weekend while Coach Garson celebrated the birth of his son Sidney, which was a great learning experience - showing me how excited I am to become a head coach - and that weekend in Seattle taught me that this is truly what I wanted to do.